The Mayor of Rotherham and staff from Rotherham Council are amongst delegates visiting Northwest China to showcase the UK's expertise in healthcare. The authority has also announced a series of Memoranda of Understanding (MoUs) with the Xi'an region to further explore opportunities for collaboration in healthcare and digital healthcare. Xi'an is the capital of China's Shaanxi Province and the most populous city in Northwest China. Representatives from the Rotherham Council visited Xi'an back in 2013 and a trade visit from the Sheffield city region to Shanghai and Xi'an took place in 2014. An MOU already exists between Rotherham and Xi'an for mutual economic development support and cultural leaders from Xi'an visited the borough at the end of 2016. 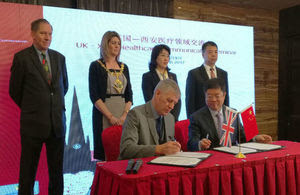 Last year, the Council joined with the Foreign & Commonwealth Office – British Embassy Beijing, ConnectChina Ltd, Yorkshire & Humber AHSN and the Sheffield City Region Local Enterprise Partnership (LEP) to target the Chinese region and the growing healthcare market. Xi'an's five year plan places digital healthcare as a priority policy for the city over the next few years in order to increase access to healthcare for the population in rural areas; to improve efficiency in healthcare delivery; and enhance the patient experience through integrated care. Xi'an is also investing significantly in new-build hospitals in the next five years, creating commercial opportunities for technology partners from the Sheffield city region with the expertise to support the design and construction of advanced digital health infrastructure. The delegation will travel to Shaanxi and Ningxia, including the cities of Xi'an, Tongchuan and Yinchuan. Led by the Mayor of Rotherham, Councillor Lindsay Pitchley, the UK delegation of 28 includes officials from Rotherham Council, senior representatives from the British Embassy in Beijing, experts from the UK healthcare sector and representatives from ten UK companies and Universities. During the five day visit, the delegation will visit local hospitals, hold business matchmaking sessions and meet senior level leaders in the three cities, sharing policy and technical expertise and boosting regional partnerships. Agreements include an MoU between Xi'an Health and Family Planning Commission and Rotherham Investment and Trade Department to promote healthcare cooperation. A training MoU has been signed between Xi'an No. 3 hospital and Sheffield University whilst Xi'an Traditional Chinese Hospital and Doncaster and Bassetlaw Teaching Hospitals will focus on remote online clinical consultation, digital health and staff job shadowing. Lyndsay Pitchley, Mayor of Rotherham, said: "The UK is internationally renowned for delivering excellent healthcare and I'm delighted to lead this delegation to visit Shaanxi and Ningxia. This is a great opportunity for our delegation to showcase their expertise to counterparts in Northwest China and enhance regional links between our countries. "There is much more we can do together and we are committed to seeking out opportunities for further collaboration with the regions." Nick Low, regional city engagement counsellor of the British Embassy in Beijing, added: "We want the Golden Era to apply across China and the UK, and we are very keen to develop our growing relationship with Shaanxi and Ningxia. So much excellent work is already underway and this is an exciting opportunity for further collaboration in healthcare. "We particularly look forward to seeing more trade and investment in both directions and we see President Xi's Belt and Road initiative as a great opportunity to collaborate with China, both within China and working in partnership on third country projects. Speaking at the seminar, Xi'an's Vice Mayor, Li Jing, noted the city would like to use the delegation's visit to strengthen cooperation and communication between Xi'an and the UK in various areas, including planning and development of Shaanxi's Free Trade Zone.